Growing Sun Belt cities aren’t generally known for their sustainable urban form. But Raleigh, North Carolina is putting the finishing touches on a plan that could break the mold. Raleigh has been working to overhaul its zoning codes with a plan that hits all the right notes: prioritizing transit-oriented, infill, and mixed-use development. But one particular feature of the plan has really captured the imagination of some local architects. Raleigh’s “Unified Development Ordinance” would allow the development of small residences along alleyways in neighborhoods currently dominated by single-family housing. This proposal would not only make taking up residence in this fast-growing city more affordable, it would dial up Raleigh’s sustainability and walkability surely and swiftly. Inspired by this provision of the plan, local architects David Hill, Erin Lewis and Matthew Griffith of the firm In Situ have developed a sleek modular dwelling design especially for the alleyways of Raleigh. The homes could be had fully equipped for $30,000, or about $200 a month in mortgage costs. 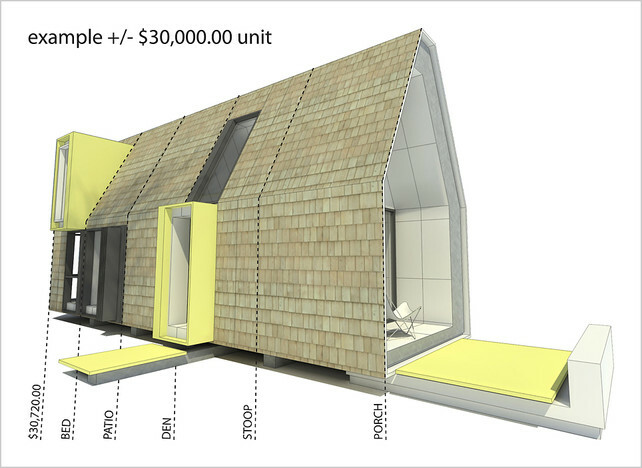 This could be a boon for existing homeowners and all Raleigh residents, the architects told Fast Company Design. Raleigh Deputy Planning Director Ken Bowers told Streetsblog that the section of the proposed code that allows for alleyway homes is controversial, and there’s no guarantee it will make into the final document and through adoption. But even without this one provision, he said, Raleigh’s ordinance will help produce a denser, more walkable, more urban city. Planners hope the new zoning will be adopted by City Council before the end of the year. Bowers added that more and more traditionally car-centric Sun Belt cities like Raleigh are adopting cutting edge zoning reforms aimed at dialing up livability: notably Memphis and Miami, the latter of which recently adopted a form-based code. The reasons for this are two-fold, he explained. Not only do most Southeastern cities, which came of age after the automobile, have relatively low existing densities, but they have strong enough demand for development that altering zoning regulations will have a big impact on urban form. “The southeast is probably leading the nation in this stuff,” Bowers said. Are these houses going to block the alleys? Alleys are important pedestrian and bike routes — versions of “woonerfs” or “slow streets.” Look at Montreal to see how these alleys are becoming great, safe routes. I’d hate to see them blocked by an infill house, especially if the surrounding streets are not “complete” with sidewalks, bike lanes, etc. No. They would just be accessed by the alleyway. Having the head of the American Planning Association as the city’s planning director must no doubt help their department in pushing these initiatives forward. HamTech, I would guess that these alleys are located on parcels which don’t have any kind of connectivity, otherwise it would be a mistake to block the access routes between properties. Related to this issue is that of mother-daughter units, something that is not considered a permitted use under most suburban zoning codes. Allowing these types of units (i.e. free-standing accessory dwellings located within rear yards on property meeting a certain square footage threshold) would go a long way toward alleviating the chronic affordable housing shortage within so many metro areas. Confusing that the design caption first says the little houses from In Situ would “fit in” alleyways, then that they would go “along” them. Putting small housing units ALONG the alleys, could convert them into mini-streets, probably one-way and narrow, good for bikers and pedestrians. I grew up in and around Raleigh — not just in the sprawl, but also 11 years attending downtown schools — and, until I read about this proposal last week, was not aware that Raleigh even *had* any alleys. My kindergarten’s mascot was “the alley cat,” and outside of Sesame Street I hadn’t the faintest notion of what an alley was. A quick examination of plat maps turns up alleys in two classic pre-war neighborhoods (Boylan Heights and Cameron Park) and on a few scattered blocks in other older neighborhoods like Oakwood, Mordecai, and Hayes Barton. However, I’d hazard that only a few hundred houses in the entire city would be affected by this ordinance. That said, accessory dwelling unit ordinances are a great way to subtly increase residential density — even though they often run into stiff opposition, since they directly affect the low-density, single-family neighborhoods that are the NIMBYs’ first and last redoubt. ADU ordinances were pioneered out west, where cities like Vancouver BC and Santa Cruz have had some success marketing the ordinances as a way to improve affordability for young families looking to buy “the big house” on the lot. This is an idea that can take on the look of many different European cities, London is a good place to observe this idea applied over hundreds of years. If the project is marketed properly, this is also a good housing and locator generator for the “services” community of workers that need to locate within the area in which they work (almost always too expensive to find housing in close proximity to the central business districts). An initiative started among bloggers called LOVE, Live Out Virtues Everyday, is an inner city movement to pull minds and hearts together to create sustainable cohabitation amongst all socio and economic classes… this idea of using alley way housing is one of those… cudos to Raliegh!